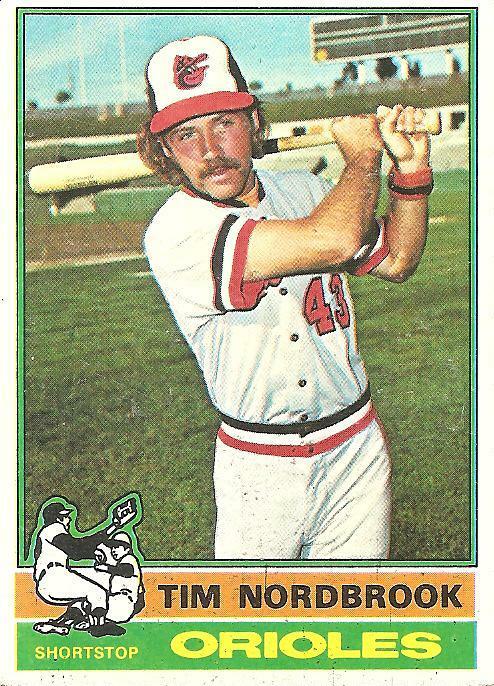 The first thing I notice when I look at this card is the sweatband on Tim Nordbrook’s left wrist. I probably noticed it as a kid and it fed into my desire to own sweatbands. The card came out in 1976, which was relatively early in my childhood, before I had fully absorbed the lesson that style is a tricky thing, much more likely to hurt you than help you. Clothes, haircuts, language, music: all these things, handled without the certain ineffable core coolness of a select few, could turn into the exact opposite of their intended usage, becoming flashing billboards advertising chronic and inescapable awkwardness and undesirability. After a few hesitant forays into attempting to handle the volatile elements of style, I more or less began my lifelong courtship of invisibility. I aspire to stylelessness. But in childhood, for a while, I loved style and wasn’t as cowed by it. For example: sweatbands. Sweatbands seemed really cool to me. But some kids who wore them seemed tough and athletic, while other kids who wore them seemed dorky and idiotic. I can’t explain why except to follow the same line of thinking I had, without consciously acknowledging it, as a kid: some people were just inherently cool. Tim Nordbrook looks pretty good with his sweatband. Part of it is that he’s got just one, the accessory providing a dashing asymmetry. Also, the dark colors work better than some sort of more garish yellowy sweatband would. And he seems like he knows what he’s doing, a comfortable look on his face, a guy at home in the world, his world. Nordbrook’s confident, relaxed demeanor is even more impressive and more suggestive of an unflappable inner calm considering the emaciated hitting statistics on the back of his card. You’d think, looking at his numbers, that he’d more likely be a jumpy, skeletal wraith with sunken, darting eyes open wide for the inevitable coming of someone with news of his release. But Nordbrook was at home in his skin and in his uniform. Baltimore is listed as both his birthplace and home on the back of the card, and, even more importantly, in terms of being at home on a baseball field, he was entirely a product of the Orioles’ hallowed minor league system that built the team’s long reign at or near the top of the standings from the 1960s to the 1980s. The “Orioles’ Way,” as it was called, taught all the players in the system the most efficient process for performing every necessary skill on the diamond. I don’t know what it would feel like to be armed with this knowledge in any walk of life, but I am guessing it would be approximately the opposite of how I felt as a kid, not knowing the Way to do anything or even that there might be such a thing as a Way. I’d have to guess that Nordbrook, given that he played a crucial middle-infield position and that he had made it to the majors despite never hitting particularly well anywhere in the minors, excelled at the schooling provided by the Oriole Way. He always knew where to be on the field, and when called upon to execute a task he knew how to do it. This has to breed confidence and ease, though I can only guess about that. When I finally got sweatbands as a kid I could tell that something was off. They weren’t as cool as I’d imagined they might be. They seemed okay when I wore them around the house or out in the driveway to shoot baskets, but when I wore them in public they turned into clumsy, bulky shackles at the end of my weakling arms. They made me wonder, as I do to this day (and as the current Baltimore Orioles, long ago cut off from the path to winning, must wonder), if there’s something out there that other people know about that makes life less of a graceless stumble. You are currently browsing the archives for the Tim Nordbrook category.